I get asked a lot how can you use augmented reality beyond the "Wow" factor and make it meaningful. There are many ways to incorporate augmented reality into your lessons. You can have your students create interactive augmented notebooks, augmented book talks/reports, augmented word walls, and so much more. I recently had a teacher friend ask me if there was a way to show words combining visually to make compound words. 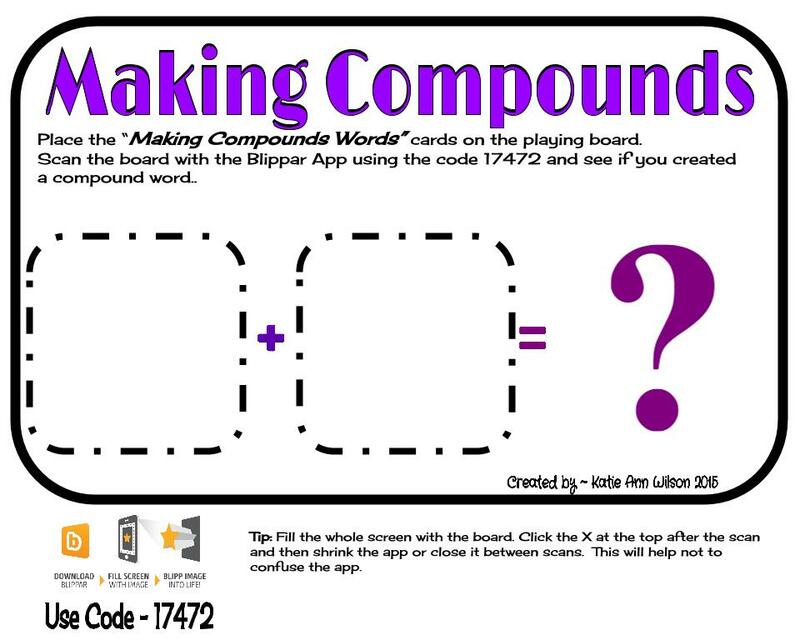 As I was working on the "Let's Make 10" augmented game, it came to me how I could show compound words. 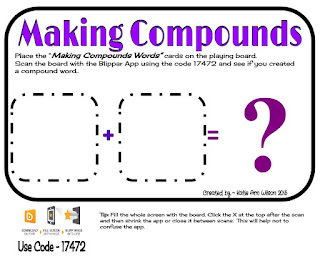 Using the "Making Compound Words" with the "Making Compounds" Board along with the Blippar app students can scan the cards and see if they make a compound word. I currently only have 4 compound words complete and plan to create more. I am even thinking of adding audio to the augmented experience. When using this board and its cards remember to go to the app's settings and enter the code "17472" before you scan. Just a tip scan the whole board, making sure the entire board appears on your device. You will want to click on the X at the top of your device's screen in between scans. You may even want to shrink the app or even close it between scans. This will help clear out the previous scan, and keep the app from being confused. When you use educational augmented content with your students please fill out this form. I would like to track how many kids are being reached with educational augmented content. I was inspired by Keven to create a Let's Make 10 augmented interactive board. He was trying to use Aurasma and was having some issues. So I thought I might give it a shot and see if I can get it to work. I really loved the idea of an interactive Let's Make 10 board using augmented reality. When it comes to creating augmented triggers your triggers have to be very unique. Color really doesn't have an effect on the how unique the trigger is. It is more the contrast between the lines and shapes within the trigger. So what I did was make each number as unique as I could with different lines, shapes and contrast between them. I placed the combination of numbers that created 10 together on the board and took a close up picture of the 2 numbers together on the board. 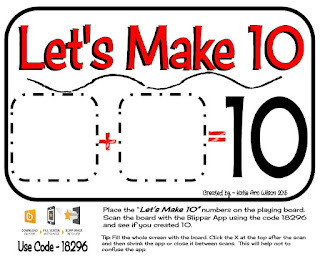 I uploaded the combination for 10 into the Blippar's Blipbuilder and created a Blip within my Math folder. I tied an image that says Correct to the Blip. So when those combinations of those numbers are scanned the image "Correct" will pop out on the iPad. I wanted to do a set of combinations that are not correct and tie a "Sorry Try Again" image but the app was getting confused. Keep in mind this is not perfect. When you are scanning to see if you make 10 scan the whole board. Make sure the board fills the whole screen of your device. After each scan click on the X at the top right side of your screen to clear the scan. You may even need to shrink or close the app between scans. This will help clear the Blippar app and not confuse it. Before you start scanning make sure you have gone to the settings within the Blippar app and enter the code "18296". If you don't make 10 you should see an image from Blippar asking you if you need help scanning, just click NO and try a new number combination. 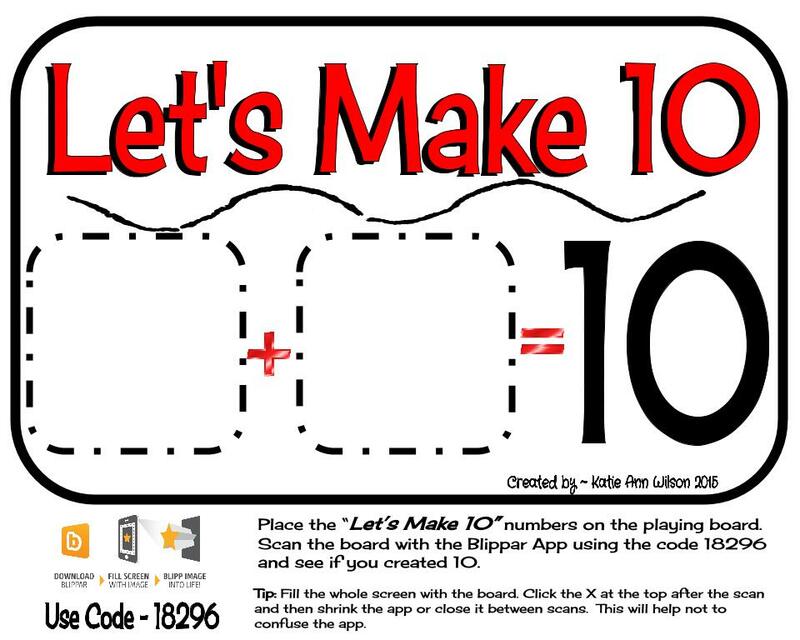 This interactive augmented board will only work with the Let's Make 10 numbers. You can print these numbers in Black and White or Color. You can also print the board and numbers on colored paper. I suggest if you are wanting to use this game with multiple kids print the board and numbers in sets with different colored paper or colored card stock. You can even laminate the board and numbers. Thanks Kevin for the idea! 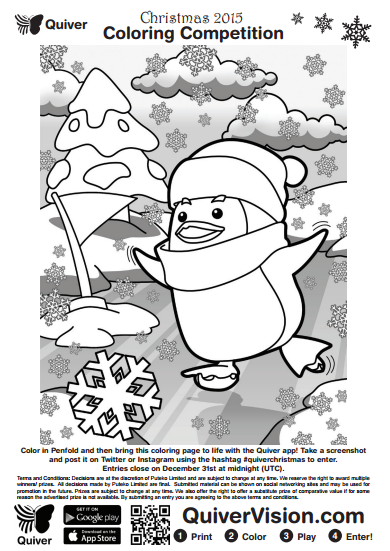 Quiver is having a Christmas coloring contest using Penfold the penguin. I love this coloring page. You can use it a variety of ways, depending on the age of your students. I can see a writing assignment on the topic of living in Antarctica or a life of a penguin. You could even do a writing assignment on ice skating or ice hokey. After your students finished their writing activity then they can color and interact with Penfold. Using the camera option within the app have kids take pictures with Penfold and share the pictures via Twitter and or Instagram using the hashtag #QuiverChristmas. The deadline for the coloring contest will be Dec. 31st at midnight (UCT), so get your entries in before the new year. Remember to use the hashtag #QuiverChristmas. Quiver will draw winners shortly after the deadline. Click HERE to download the free Penfold coloring page. If you have used Penfold in the past you may have to update within the app. 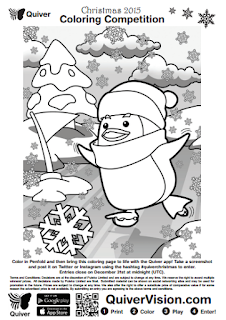 There are also some fun new coloring pages. Give them a try, they will make a fun center activity, and help bring a little augmented magic to your classroom. 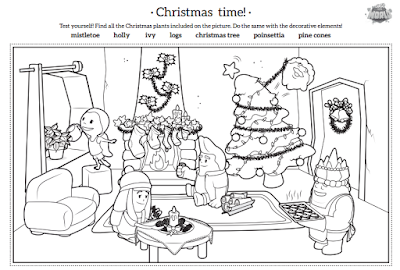 Visit the Quiver website to download and print the magical interactive coloring pages. To play the game and to watch Penfold skate around click on the snowflake button. Augmented reality is a fun way in getting kids reading and writing. Chromville also agrees and has created a contest to give away some pretty cool Chromville prizes. Do you like reading stories? Follow them on Facebook because along this month they will publish the first Chromville tale! Get ready to accept the challenge. All the participants will be include in the sweepstake of one Chromville pack! Comment any of our post about our Christmas story. Share any of our Facebook posts. The winner will be announced in December 28! Chromville wants to invite you to take part in their Christmas challenge. The winner will get 5 free codes of Chromville World! 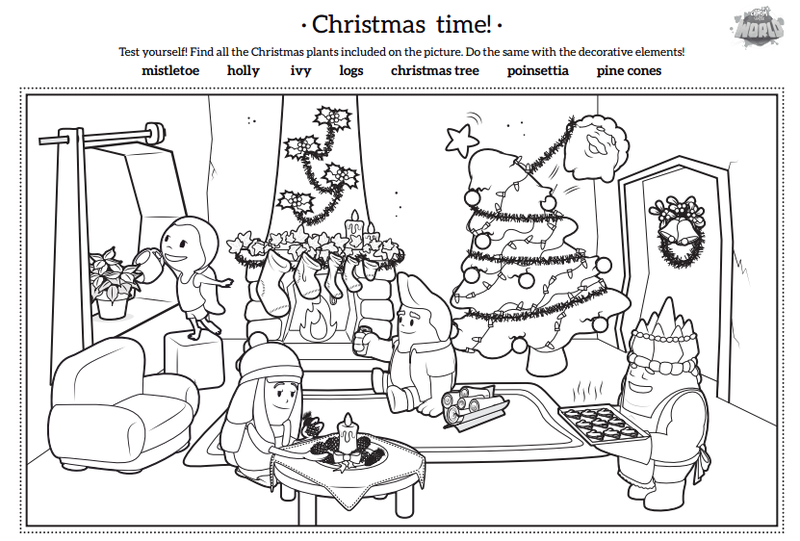 Christmas cozy picture: learn about the Christmas plants and the decoration elements with the Chromers. Include whatever you want to make more beatiful the illustration! 2D material to build up a Christmas handmade gift box. The best option to hide a special present for your loved ones! Christmas Augmented Reality postcard to wish Merry Christmas to all your family and friends. Remember, it is included in the first Chromville app! 2. 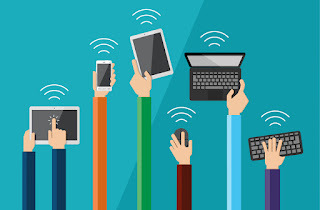 Show your activity on your own blog: everybody will see how creative your are students! 3. Share your post with them on social media (Twitter, Facebook, Instagram, Pinterest or Youtube). The more you do it, the better! 4. The most creative post will be the winner. Do your best! Don’t forget to mention Chromville, it is needed to be included in the contest!